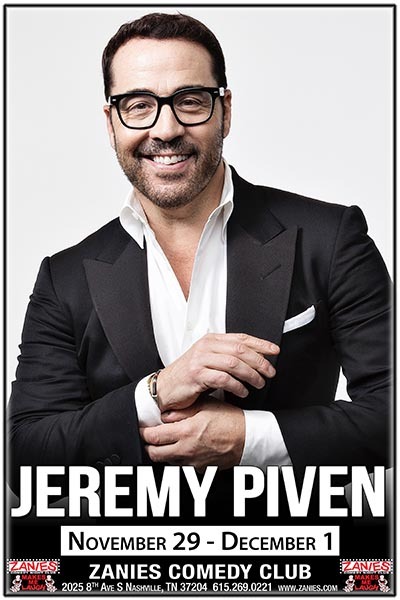 Jeremy Piven: Jeremy Piven was most recently seen as a series regular in the CBS television series WISDOM OF THE CROWD. He was also recently seen as Harry Gordon Selfridge in the popular PBS series MR. SELFRIDGE. Among his many notable roles, Piven is best known as movie agent “Ari Gold” in the hit HBO series ENTOURAGE, which aired for eight seasons and won Piven three Emmy Awards and a Golden Globe. In 2015, Piven reprised the fan-favorite role in the ENTOURAGE feature film released by Warner Bros. He was also seen in SIN CITY: A DAME TO KILL FOR from directors Frank Miller and Robert Rodriguez. Jeremy’s extensive career in television also includes the satirical THE LARRY SANDERS SHOW. In film, he starred in Mark Pellington’s drama I MELT WITH YOU, Gaby Dellal’s heart-wrenching ANGELS CREST, Gary Fleder’s RUNAWAY JURY, Todd Phillips’s hit comedy OLD SCHOOL, Ridley Scott’s BLACK HAWK DOWN, Peter Chelsom’s SERENDIPITY, Brett Ratner’s THE FAMILY MAN, Peter Berg’s VERY BAD THINGS and THE KINGDOM, Cameron Crowe’s SINGLES, Joe Carnahan’s SMOKIN ACES, Guy Ritchie’s ROCKNROLLA, and THE PLAYER for director Robert Altman. In 2005, Piven returned to his theater roots starring in the off-Broadway hit FAT PIG by Neil LaBute, for which he received a Distinguished Performance Honor from the Drama League. He also appeared as Bobby Gould on Broadway in SPEED THE PLOW.